The new senator from Massachusetts has the savvy and guts to take on big (and ungrateful) finance. When new members arrive in the US Senate, they are supposed to take a seat on a back bench and listen quietly for a couple of years. That is not in Elizabeth Warren’s nature. She had been a US Senator from Massachusetts for only about a week when she broke with etiquette. Warren was outraged that AIG investors were urging the insurance giant’s directors to join them in a lawsuit against the federal government, claiming damages from the federal bailout of their company during the financial crisis. The freshman senator sent out a tartly worded statement to her many fans and followers. 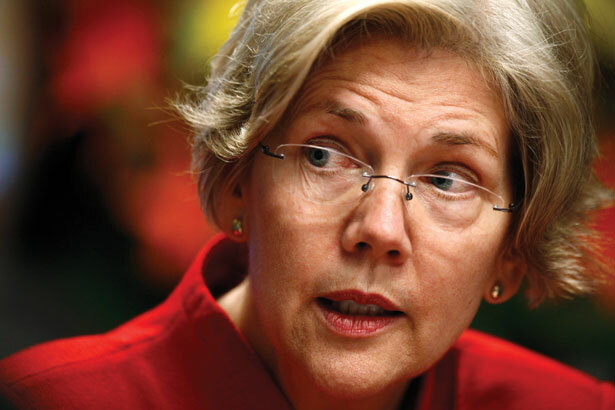 “AIG should thank American taxpayers for their help—not bite the hand that fed them,” Warren wrote. The message swept the blogosphere like wild fire. The AIG directors folded the next day. It is perhaps mistaken to assume her voice alone stopped this corporate ingratitude in its tracks, but that may well be the message absorbed in Washington politics. Try not to provoke this new senator, especially on the stuff she knows a lot about. She might bite back. Indeed, Senator Warren has renewed the accusation about the AIG bailout she had made a year ago during her Senate campaign. While the Federal Reserve pumped a fortune ($182 billion) into saving AIG from failure and thereby protected Wall Street megabanks from huge losses, the Treasury Department was arranging its own “sleuth bailout,” as Warren charged. Treasury granted an exception to the standard tax rules that delivered billions more to AIG in the form of a special tax break. What separates Elizabeth Warren from your typical newcomer to Congress—in addition to the rare gutsiness—is her deep knowledge of banking and finance. For many years, while she taught at the Harvard law school, Warren was a lonely crusader, exposing predatory bankers and the cruel terms by which millions of families were driven into bankruptcy. Her reputation led to appointment as the chair of the Congressional Oversight Panel that investigated the AIG bailout in great depth. The COP final report is itself an extraordinary document of government—clear and concise, an unflinching analysis that describes exactly how the Federal Reserve and the Treasury failed to serve the public interest in their incestuous bailout of Wall Street titans. “The AIG rescue demonstrated that Treasury and the Federal Reserve would commit taxpayers to pay any price and bear any burden to prevent the collapse of America’s largest financial institutions,” Warren’s report concluded. She will be heard. The new senator will serve on the Senate banking committee and she already knows where a lot of the bodies are buried. I suspect some of those disgruntled AIG investors are wishing they had kept their whining to themselves. For more on corporate accountability, read William Greider's roast of AIG shareholders.